The beavers have been busy at work this year. I've been here for four years and only seen beaver lodges, not dams. I often have to explain the difference to people. Beaver dams block up water and create beaver ponds where beavers then create round lodges where they live. Beavers do not live in beaver dams. The lake at work, Terrapin Lake, is a large body of water with several beaver lodges. The beavers were reintroduced to the Wilder/Warner 2000 acres back in the 1960. They haven't built any dams on the property since the early 1980s. There was a drought at the time and sinking water levels forced them to build a dam in "the narrows" between Terrapin and Mays lakes. For the first time in twenty years there is again a dam in the narrows. I first spotted it toward the end of the summer. At first it was just some rocks ad a couple of sticks. I wasn't sure it it was just some kids playing around. Over the next few weeks the dam grew. The two foot high dam is constructed of small branches, mud, rushes and even baseball size stones. It is easy to say that sinking water levels in Terrapin spurred the building but there is more to the story. A former naturalist who lives in the area told me that beavers near long lake have plugged up the Brown family creek with a small dam. This has prevented water from reaching Terrapin. So, a lack of rain lowered water levels in Long Lake and beavers responded with a dam to keep the remaining water from draining into Terrapin. Alarmed by the lack of water in Terrapin, beavers there have blocked water from draining into Mays lake. 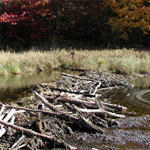 Imagine the beavers in Mays lake are madly searching for a spot to build a dam as well. The narrows dam has paid off for the beavers. Water levels have remained high in terrapin lake while they have fallen in Mays lake. this means that when winter comes the entrance to the lodges will be safely underwater where the beavers need them. The dam is now roughly two feet high. I wasn't all that impressed until I did some quick math. Let's assume Terrapin lake is on average 396 feet wide (okay, so I cracked out a map and ruler here) and that the length of all the bays added together equals 11,276 feet. That gives a surface area of 4,861,296 feet. Almost five million square feet is pretty good size! Now, we need to know how many gallons per cubic foot of water. There are about 7.48 gallons of water per cubic foot. If the dam has held lake levels one foot higher than we can say Terrapin has 4,861,296 cubic feet more water then it would without the dam. Multiply by 7.48 and we get 363,624.900 gallons of water! But wait, the dam is two feet high so double that to 727,249,900 gallons of water that this tiny dam is holding back. That's almost three quarters of a billion gallons!